The Crabbie's Grand National (Handicap) Grade 3 Class 1 race over 4m 3f 110y is a true racing spectacle. For National Hunt trainers it is the ultimate prize. 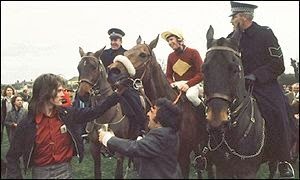 Jockeys the accolade they all cherish. The winning horse immortalised in racing history. In 2009 John Smith's launched a poll to determine five personalities inducted into the inaugural Grand National Legends initiative, inscribed on a commemorative plaques at Aintree. Sir Peter O'Sullevan, the commentator who called home the winner of fifty Grand Nationals on radio and television from 1947 to 1997. In 2012 and 2013 additional legends were added.